Most wallets are utilitarian, meant to be taken out when you buy something then tucked back into a pocket or purse. Not a Paperwallet. 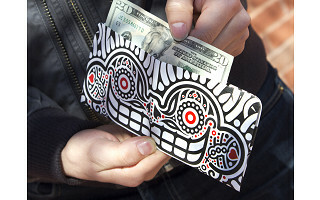 Each is a work of art that adds vibrant, graphic appeal to the mundane task of carrying your cards and money. The company was founded by Elad Burko (aka Dado), whose ultimate goal was to find a new way to expose the talents of street artists and designers. He enlists artists from around the globe to design Paperwallets, and in return, the artists gain a platform to showcase their work and a share in the financial success of their designs. Dado corralled a group of artists and entrepreneurs in an effort to create the most comfortable wallets in the world -- paper-thin yet expandable, durable, eco-friendly, stuffable but not stuffy. Made from Tyvek (the same tear-resistant material used in house wrap and courier envelopes), each wallet has two credit card slots, two business card flaps, two side pockets, and a cash compartment. Where they differ is in the designs. Paperwallets are fresh, functional and affordable. Plus, they provide a great way to support emerging artists. Are you ready to put your money where your art is? Paperwallet - since day one - has always been about becoming a platform for artists to get their name out there in a totally new way. Every wallet is a canvas for the artist to design, and becomes this beautiful vehicle to connect with new fans and new artists from around the world. We chose to use Tyvek - a paper thin, ultra durable, and expandable material that is perfect for today's wallet. Not only is it as comfortable and functional as any other wallet, but Tyvek is a great place to print the artwork without losing the details. Is there a way to be kept aware of new designs asa they are added? We are constantly working with new artists to collab on new series of wallets and new products. This summer we have started working with different fashion brands that act as curators to bring some new flavor to the Paperwallet collection. Stay tuned to The Grommet site and social channels to stay updated. So you understand, we come out with a new series of wallets twice a year - in the winter and in the summer. They are all limited edition and when they sell out they sell out unless we agree with the artist to do another run. Love these wallets! I have a few artists in my family (my father and teens) and wondered if you accept submissions for designs and if so, how do they go about it? Thanks! How would I go about submitting work? I would love to be a part of your company and get my art out there! Please contact us at [email protected] and we will put you in touch with Dado about this. So great to see our community so enthusiastic about becoming a part of this work. Most wallets are utilitarian, meant to be taken out when you buy something then tucked back into a pocket or purse. Not a Paperwallet. 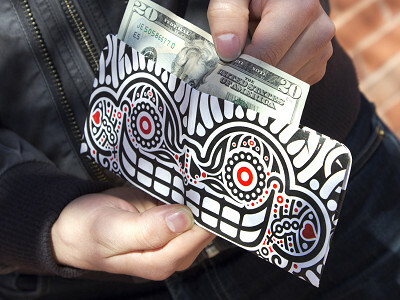 Each is a work of art that adds vibrant, graphic appeal to the mundane task of carrying your cards and money. 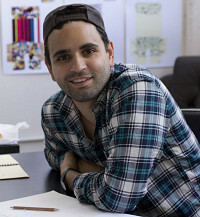 The company was founded by Elad Burko (aka Dado), whose ultimate goal was to find a new way to expose the talents of street artists and designers. He enlists artists from around the globe to design Paperwallets, and in return, the artists gain a platform to showcase their work and a share in the financial success of their designs. Dado corralled a group of artists and entrepreneurs in an effort to create the most comfortable wallets in the world -- paper-thin yet expandable, durable, eco-friendly, stuffable but not stuffy. Made from Tyvek (the same tear-resistant material used in house wrap and courier envelopes), each wallet has two credit card slots, two business card flaps, two side pockets, and a cash compartment. Where they differ is in the designs.